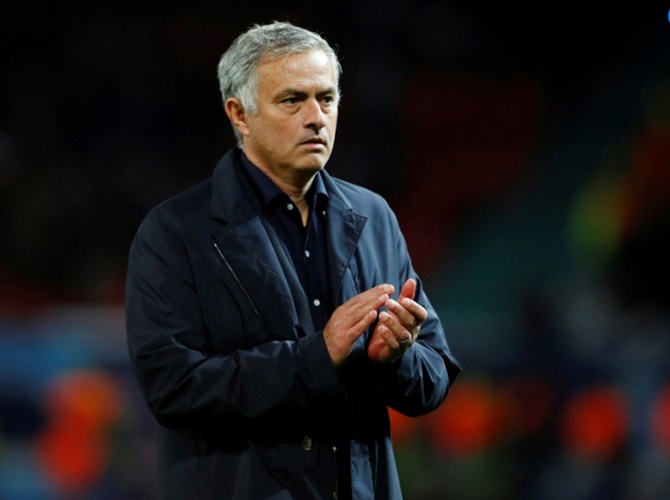 Manchester United manager Jose Mourinho has promised to show plenty of restraint and respect if he inflicts a first Premier League defeat of the season on his former side Chelsea on Saturday. Mourinho, who had two spells in charge of the London club and led them to three league titles, has not enjoyed previous meetings with Chelsea as United boss, losing four out of six matches including this year's FA Cup final. "For me it's another game. Would I celebrate like crazy my team's goal or victory at Stamford Bridge? I don't think so," Mourinho told a news conference on Friday. Without referring to that incident or Conte, Mourinho said that he would always be mindful of his actions when visiting his former club who are second in the table, six places above United. "I'll try always to control myself and to respect the stadium and supporters that were my supporters and my stadium for many years. To do that I would have to lose my emotional control, which is not easy," Mourinho added. "I would always think where I am, which stadium I'm in and which public is in the stands. It's just another match for me. A match I want to do well in for my players, my team and my supporters. I'm 100 percent Manchester United tomorrow." Meanwhile, United were fined 15,000 euros ($17,00) and Mourinho warned by UEFA after arriving late for their goalless home draw with Valencia in the Champions League this month, European soccer's governing body said. British media reported that United's bus had been held up in traffic on the way to Old Trafford and arrived 45 minutes before kickoff of the Group H match, which was put back by five minutes. 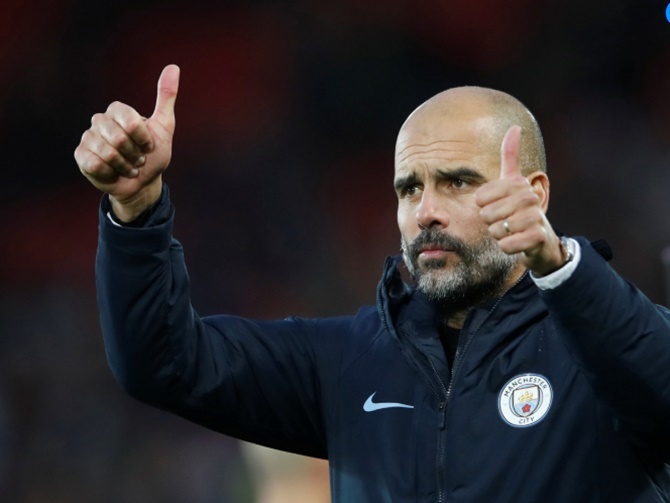 Former Manchester City goalkeeper Joe Hart can expect a warm welcome when he returns to the Etihad Stadium with his new club Burnley on Saturday, according to City boss Pep Guardiola. Hart was loaned out by Guardiola shortly after the Spaniard took over at the club, moving to Torino and West Ham United in the past two seasons before joining Burnley in August. Hart, 31, made 348 appearances for City during 11 years at the club and won two Premier League titles as well as making 75 appearances for England. Saturday's Premier League match will mark the first time Hart has returned to face City. "There's no doubt how important Joe Hart was and is. Tomorrow, we will see the people appreciate what he has done for this club," Guardiola told a news conference. Hart underwent pre-season training with City before his move to Burnley and City defender Aymeric Laporte said he was impressed by his professionalism and agreed with Guardiola that he will be well received by City fans. "He's a very good goalkeeper and a very good person, too. He was well liked by all the players and I think the supporters of Manchester City love him because of his achievements over the years," said the Frenchman. "He trained really well and was very professional during the summer, so it will be nice to see him again and I am sure he will get a fantastic reception when he walks out on Saturday." After struggling for form at West Ham last season and losing his England place, Hart has enjoyed a revival in form at Turf Moor and his manager Sean Dyche says he will have nothing to prove to Guardiola. "I think to be fair, if you take away the noise I don't think there's ever been any real problem with him, the manager or the club," said Dyche. "Everyone knows what a good servant he's been there. He's been a big part of their recent history. "I didn't bring him to prove a point to anyone. In my opinion he's another top class goalkeeper that we've got here. Another one. "I don't want to speak for him but I don't see why he's got any point to prove -- other than to himself. To continue to show what a top class keeper he is." Liverpool will be without injured midfielder Naby Keita for Saturday's Premier League trip to Huddersfield Town but defender Virgil van Dijk has recovered from a rib problem, manager Juergen Klopp said on Friday. Keita, who has featured in all eight league matches for the club so far, went off with a muscle problem in Guinea's 1-1 draw with Rwanda on Tuesday. Liverpool are also sweating on the fitness of striker Mohamed Salah, who picked up a groin injury on international duty with Egypt while fellow forward Sadio Mane is a major doubt after having hand surgery. "We had yesterday's session and a few of the boys trained. We have to see how they reacted after that. It's pretty sure that Naby will not be available. With the rest we have to see how it develops," Klopp told a news conference. Defender Van Dijk missed the Netherlands' 1-1 friendly draw with Belgium last week, still struggling with a rib injury that he suffered against Southampton last month. "Virgil would not leave a game without any major problems but it's settled quick and that's how it is," Klopp added. "Football players have to play very often with some kind of pain, that's how it is. It's all good, he has no problems with that anymore." Third-placed Liverpool are looking to extend their unbeaten start while Huddersfield, managed by Klopp's former team mate at Mainz David Wagner, are winless and in the bottom three. However, the German said Liverpool would be wise not to underestimate their rivals. Crystal Palace winger Wilfried Zaha will be assessed before Sunday's Premier League clash at Everton after sustaining a muscle strain on international duty last week, manager Roy Hodgson said on Friday. Zaha, who played in Ivory Coast's 4-0 win against Central African Republic last Friday, returned to the club earlier than expected and is yet to resume full training. "It's good news that he's close enough to be assessed, to see if he is fit enough to play. If he is able to train tomorrow I guess he could be available to play," Hodgson told reporters. British media reports had said that Zaha, who is Palace's top scorer this season with three of their meagre tally of five league goals, could be out for up to two months. "You're taking me into areas of sport science I don't feel comfortable talking about... I don't know where the information that this is a two-month injury came from, but we've never been mindful that it would take such a long time," ," Hodgson said. "It's a strain which players get on a fairly regular basis and some recover quicker than others. Wilf is a quicker than normal recoverer but it'll depend on the extent of the injury whether he is a possibility to recover or not." Palace are 14th in the table with seven points from eight matches while Everton are three places above them.